Just like our bodies are bioelectrical, there is a whole energetic system inside of us that is called the Chakra system. The word “chakra” itself is derived from the sanskrit word “wheel” and is literally translated to wheel of energy. 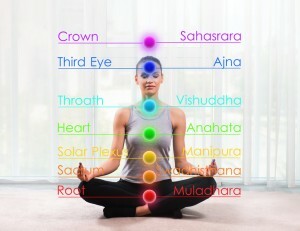 In yoga, meditation, and Ayurveda, chakra refers to wheels of energy throughout the body. There are seven main chakras, they are stacked following the spine, starting from the tailbone through to the crown of the head and mirror 7 main nerve centers in the physical body. To visualize a chakra in the body, imagine a swirling wheel of energy where the physical and spiritual bodies meet. This invisible energy is called Prana (or breath of life–Genesis 2:7) it is the force that keeps us alive. This flow of energy is directly affected by your thoughts, emotions, health and state of mind. I will publish more articles about balancing the chakras, but for the purpose of this information, simply knowing they exist is key. When our chakras are out of balance, specifically the lower chakras when referring to grounding we tend to be “in our head” and have trouble executing the ideas we have. It can cause us to be stuck in eternal planning mode, it can cause anxiety, worry and fear. These emotional and energetic troubles then manifest themselves as physical ailments. You can look at it in a number of ways, it could be considered a meditation or getting centered, maybe even called a visualization. Energetic grounding is also a form of balancing your Root Chakra. How do I know if I need to be Grounded? problems with groin, hips, legs, knees, calves, ankles, and feet. Just like physical grounding or hydrating your body, this is not a once and done fix. You have to continue to ground energetically in order to maintain the connection. This can be done ANYWHERE. Indoors, outdoors (bonus points if you do it while physically grounding!) The two most versatile options are the grounding meditation and the intention eating of grounding foods. Just like physical grounding or hydrating your body, this is not a once and done fix. You have to continue to ground energetically in order to maintain the connection. There are several ways to ground the energetic body, and best maintain that connection. you don’t have to do all of them at once or all of them to make it work, you simply chose what resonates and leave behind what does not. These can be applied topically to the emotion points on the ear (auricular emotion points). ( #healinghack Many have trouble with pinpointing the exact spot, rub gently over the entire ear except the ear canal–never put essential oils in your ear canal). You can also massage this into the root chakra (tailbone) with a carrier oil of your choice, or diffuse in the room you are in. I like to keep solutions simple, and this is one of the most simple, do anywhere solutions. Follow this simple grounding meditation. Sit full in whatever furniture you are sitting on, feet uncrossed and on the floor. Allow the chair to fully support you. Take a few deep breaths, in through your nose and out through your mouth. When you take deep breaths your entire belly should fill and protrude on in the inhale and shrink belly button towards the spine, on the exhale. Now that you are fully supported, envision a cord from the base of your spine, right at your tailbone reaching from your tailbone to the center of the earth, grounding you in stable warmth. The cord can look like anything you would like it to, anything you see is perfect. Feel the grounding safe energy in your root chakra, and see it spinning clockwise in bright, red, healthy, glowing light. You can stay in this space as long as you like, and return to it at any time you feel you need to. When you are ready, wiggle your fingers and toes and return to the place you began. There are many crystals and gems that carry grounding properties, this can be achieved by holding the crystal or simply placing it in your pocket and going about your daily duties. There are many foods that can be effective to ground you energetically, but lets cut to the most important one: chocolate. Dark chocolate is a very effective grounding tool. Also meat and protein, the most physical of foods have great grounding qualities. You may be thinking, “I eat meat all the time, why aren’t I grounded enough?” Simple. It’s all about intention, next time you are enjoying red meat be intentional about it grounding your body. If you are interested in testing the benefits of physical grounding for your self, please join our free challenge! There will be tons of lovely prizes–and you will feel better too!